Spring autowiring by constructor is similar to autowiring by type but it is applied to constructor argument. If more than one bean property matches, then it throws fatal exception. I am taking example of autowire by “constructor” here.It will be almost same as Dependency injection via setter method with some changes in XML configuration file. 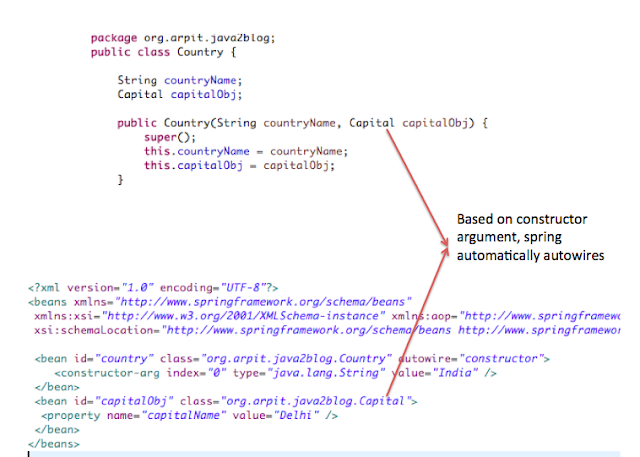 Create Country.java under package org.arpit.java2blog.Copy following content into Country.java. In above xml, we have declared two capital beans,now how it will autowire. It will give you below exception. This is very good Tutorials. Thanks for your efforts. I will share your website with my friends. Thanks.